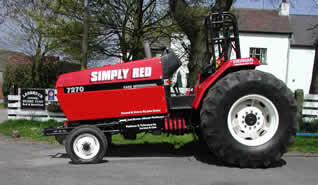 Simply Red was originally built by Dave Powell using parts from the Dutch Superstock Tractor Brutus back in 1994. 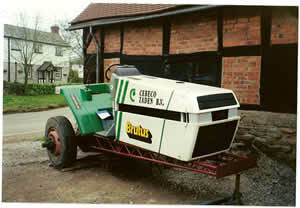 J & L Racing (John & Lorena Eccles) bought the Tractor in 2006 from AW Blake who had run the machine for several years. John & Lorena have been involved with Tractor Pulling for over 10 years helping the North West Tractor Pullers Club. John's involvement extended to being an member of the very successful Desperate Dan Team. Having been a rider of, and competing in Moto Cross Twinshocks for a few years previous to Tractor Pulling, John's urge to be back in the seat was fulfilled with the purchase of Simply Red. A new coat of paint was the first order of the day for the Tractor and J & L Racing was formed to begin the steep learning curve into the world of Prostock Pulling.